The Green Biscuit Behaves Like a REAL Puck, Even on Pavement! I’ve gotta admit, the first time I saw the Green Biscuit online, I didn’t get it. It seemed a little weird, and kinda “gimmicky” to me. So we grabbed a couple of old sticks from the back and went outside to the parking lot. Darren was right! The Green Biscuit did behave just like a real puck. In fact, I’d NEVER seen a puck stay so flat while passing across such a bumpy surface. We messed around in the parking lot for a bit. 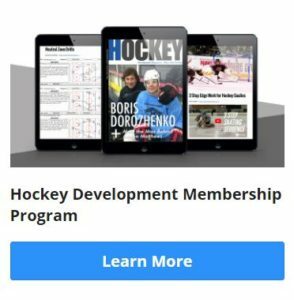 The more I used the Green Biscuit, the more impressed I became with it… I started passing harder and harder, trying to “test the limits” of the puck. I was thinking at higher passing speeds, it would surely skip up if it hit a rock or something. Nope! It just stayed flat. After a few minutes of really zinging it back and forth, Darren told me to try throwing some sauce. So of course, I took the invitation… once again, I was amazed. 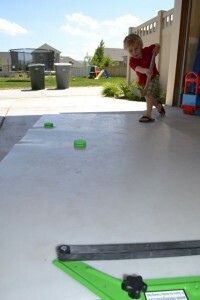 I threw Darren a saucer pass, and the Green Biscuit floated nice and flat through the air, then hit the ground AND STUCK! Before long, Darren and I had spread way out, and were firing saucer passes across the parking lot at each other. Needless to say, I was sold. The reason the Green Biscuit works so well is because of the design. It’s about the same size as a regulation puck, but it’s about an ounce lighter (when friction is factored in, it feels about the same as a regulation puck feels on the ice). Next, the middle is recessed, so contact points with the surface are minimized. 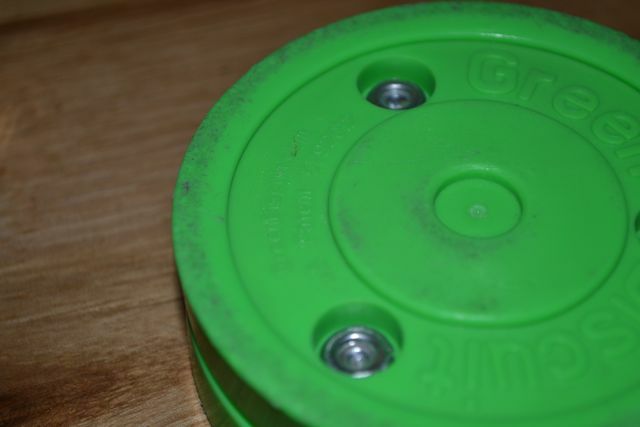 In fact, you can see the wear marks on my puck cover about a 2 mm area around the outer edge of the puck. The most interesting design element is the Green Biscuit’s two-piece, “hinged” assembly. 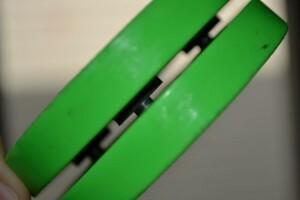 Three metal dowels hold the two halves of the green biscuit loosely together. There are foam cushions in the middle that dampen any bumps. This set-up acts a lot like shock absorbers in a car, with the bottom half of the puck having the flexibility of “adjusting” to the bumps in the surface. This is a really fun puck to mess around with. If you have the chance, take the Green Biscuit out and give it a whirl. It’s so much fun to use, you might lose track of time once you get passing it around (that’s what happened to me at least!). I had so much fun shooting the footage for this video review, that I took a lot longer to make it than I needed too. 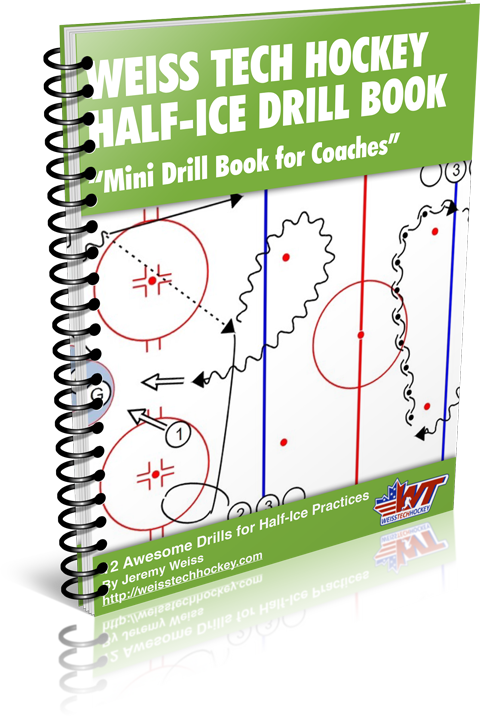 It’s a great puck to use for stickhandling on just about any surface, and it’s even more impressive when you start working on passing. I definitely give the Green Biscuit two thumbs up!